Tetzlaff, more than any other violinist around today, is utterly attuned to Schumann's idiom in these later works: the mercurial changes of mood are conveyed as if they're the most natural thing in the world (...). This, quite simply, wipes the floor with the competition. If you have the slightest interest in Schumann's chamber music, add it to your shelves. There's no doubting the rewarding partnership of Christian Tetzlaff and Lars Vogt in this admirable account. Their partnership is equal throughout (...). Piercing intelligence and verve illuminate each movement; and Tetzlaff is never afraid to take his tone right down to a whisper, enhancing the works' everpresent shadows. There is exemplary tenderness, tempered at all times by good sense. Robert Schumann kommen die wenigsten Geiger unserer Zeit so nah. Und Vogts Klavierspiel ist schlicht kongenial. Eine kleine Sensation. 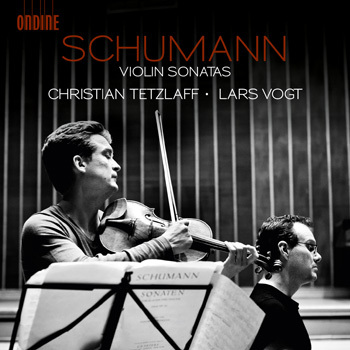 Ondine is pleased to announce the second chamber music recording with violinist Christian Tetzlaff, featuring his long time musical partner pianist Lars Vogt. With the selection of these violin sonatas for violin and piano by Robert Schumann (1810-1856) the artists show the development of the composer, including the third sonata that was neglected for a long time after Schumann's death and only premiered in 1956. Christian Tetzlaff has been considered one of the world's leading international violinists for many years, and still maintains a most extensive performing schedule. Musical America named him "Instrumentalist of the Year" in 2005 and his recording of the violin concertos by Mendelssohn and Schumann, released on Ondine in 2011 (ODE 1195-2), received the "Preis der deutschen Schallplattenkritik". The earlier release of Sonatas for Piano and Violin by Mozart (ODE 1204-2) with Tetzlaff and Vogt has won many awards, among them the Gramophone Editor's Choice and the Recording of the Month, Chamber Choice, for BBC Music Magazine.